Joe Everson started Tennessee Tiny Homes in 2012, but Joe has over 15 years experience building custom homes. He’s located near Memphis, Tennessee and in the last year has completed several homes. What I like about Joe’s work is the diversity of designs he’s exploring – no two houses are alike. They are all outfitted a little differently too, based on the buyer’s needs I assume. They also shows off Joe’s diverse skills. He is also working on offering financing in an attempt to make his homes more accessible for buyers. Unlike a normal mortgage, it should be possible to pay off a tiny house in the time it takes to pay off a car. You can find Tennessee Tiny Home on Facebook. 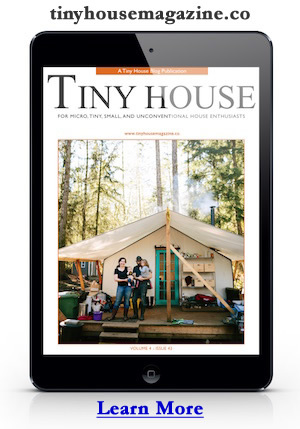 Also check out their sister company Tiny Happy Homes. Photo credit to Tennessee Tiny Homes. Above & Below: Mendy’s tiny house. This entry was posted in Builders, Uncategorized and tagged Joe Everson, memphis, tennessee, tiny house. Glad to see a tiny home builder in my former home state. Tiny homes (not on wheels) are not new to TN but they are built by their owners or shed conversions. I like all the light in these homes. My youngest son would complain about watching that flat screen tv because he would have to turn his head too much to see the whole screen :-). I have a suggestion for tiny homes in general. It concerns the sleeping loft. To gain some headroom, two peaked roofs that intersected over the loft could increase headroom without increasing height and the use of a homemade lapeyre stair http://www.lapeyrestair.com/#2 could increase accessability without taking up much square footage. Gotta love the slingshot hanging by the front door. I am really interested in building a tiny house on wheels and taking it on road but need more info! Please call me about your homes or provide a number where you can be reached. love you Timy Homes, I’m in Illinois so I need something well insulated for the cold. Can I pull a tiny house with my Ford Edge? I would like more info on building a tiny home. We’ve emailed in the plast,but I’m ready to get started! Love Love Love the outhouse! ingenius use of space and design,it has everything. I wanted to know the cost? Little old Lady in jersey need my own mother in law suite it’s a beauty.